Soil salinization is one of the major constraints in achieving food security and reducing environmental degradation in Ethiopia. Restoration of salt-affected lands into productive lands and protection of newly developed areas from the spread of salinity is therefore of paramount importance. In highly salinity areas where technical solutions to soil rehabilitation are expensive and time consuming and growth of normal field crops is restricted, use of bio-remediation methods including planting halophytic forages could bring saline soils back into production. This paper identifies different causes of salinity and characterizes soils based on severity of salinity levels. 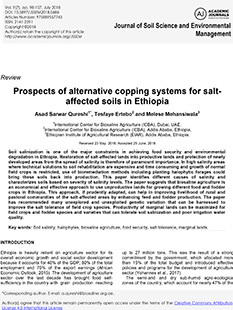 The paper suggests that biosaline agriculture is an economical and effective approach to use unproductive saline lands for growing different food and fodder crops in Ethiopia. This approach, if prudently adapted, can help in improving livelihood of rural and pastoral communities of the salt-affected areas by enhancing feed and fodder production. The paper has recommended many unexplored and unexploited genetic variation that can be harnessed to improve the salt tolerance of field crop species. Productivity of marginal lands can be maximized for field crops and fodder species and varieties that can tolerate soil salinization and poor irrigation water quality.